Inspired by the formation of native water-lilies of Amazon River basin, Victoria amazonica, Nympheas is a constellation of multiple centres in which the Amazon ecosystem can be learned about and observed. 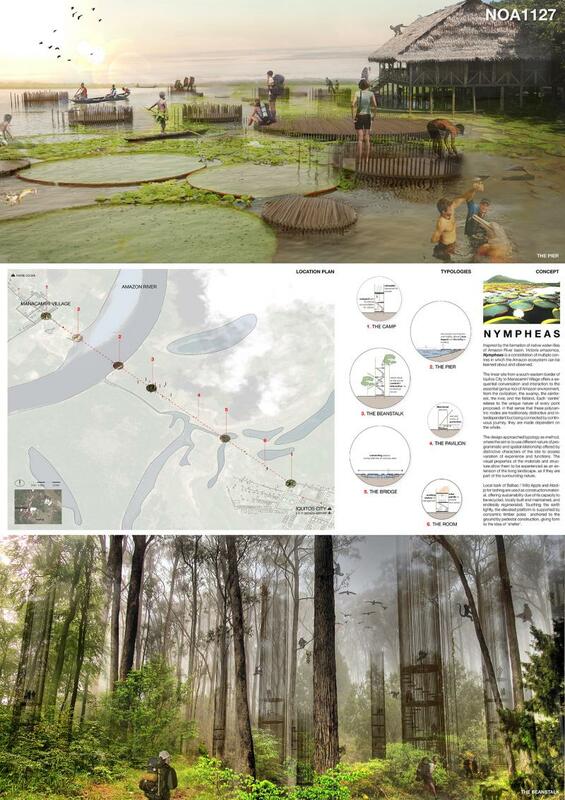 The linear site from a south-eastern border of Iquitos City to Manacamiri Village offers a sequential conversation and interaction to the essential genius loci of Amazon environment, from the civilization, the swamp, the rainforest, the river, and the flatland. Each ‘centre’ relates to the unique nature of every point proposed, in that sense that these polycentric nodes are traditionally distinctive and interdependent but being connected by continuous journey, they are made dependent on the whole. The design approached typology as method, where the aim is to use different nature of programmatic and spatial relationship offered by distinctive characters of the site to access variation of experience and functions. The visual properties of the materials and structure allow them to be experienced as an extension of the living landscape, as if they are part of the surrounding nature. Local bark of Balbac / Wild Apple and Atadijo for lashing are used as construction material, offering sustainability due of its capacity to be recycled, locally built and maintained, and endlessly regenerated. Touching the earth lightly, the elevated platform is supported by concentric timber poles anchored to the ground by pedestal construction, giving form to the idea of ‘shelter’. Therapeutic understudies can truly get focal points from these medicinal related web journals. While doing therapeutic no understudy needs to take a shot at papersplanet.com. However, the facts confirm that understudies need to take a shot at various restorative terms. These terms can be hard to comprehend as referenced in the sites yet these are vital. It's an amazing proposal. Congratulations!